Listening to and talking with parents who are grieving the loss of their baby, worried about their baby in a NICU or special care nursery, or needing to talk during other perinatal times such as bed rest. This has been Neo-Fight's most important function since 1976. Yearly and as need arises, we make deliveries of "NICU Baskets" filled with such things as Neo-Fight information, Preemie Clothes, Single-Use Cameras and Hershey Hugs to the Nursing Staff at 11 area hospitals. We speak about Neo-Fight and our mission with students at the School of Nursing, the School of Medicine, School of Education, and the Medical Genetics Program at IUPUI. 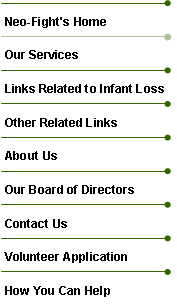 We maintain the Neo-Fight website with listings of Indiana resources, national resources and on-line support groups. We publish a full-page listing about Neo-Fight in the Rainbow Book, a directory of human services in Central Indiana. We periodically publish an updated and revised version of our Listener Training Manual.